Thread: Anyone know anything about the "Ya-I-Go"? aka the Japanese Goliath? I stumbled upon this entry in Taki's IJA page, and was interested to find out more. Sadly information regarding these are scarce in Wikipedia or even all the rest of the internet. Was it solely cable controlled? or was there a radio controlled version? I managed to contact Taki for some questions, I might as well post one of them relevant to this post. envisioned to be used in the way the German Goliath was?" "The purpose and the way of Ya-I Go is basically the same as Goliath." Last edited by Arreally; 09-09-2015 at 10:37 AM. Re: Anyone know anything about the "Ya-I-Go"? aka the Japanese Goliath? I did a thread somewhere about these types of remote demolition devices a while ago somewhere. Everyone talks about the 'Goliath' as though it was the progenitor of the device - they were in use long before though with French, US and British engineers developing them from prior to WW1 iirc, throughout the 1920's and 1930's. Everyone does for anything German to be honest, in all the amateur world war 2 enthusiast forums I've seen, everyone raves for either Soviet or German tech. I just wondered how effective they would have been, the 40 kg bomb carriage wouldn't have scraped a pillbox well enough, and with it's speed, especially through rough terrain, couldn't possibly be able to get close enough to a tank. 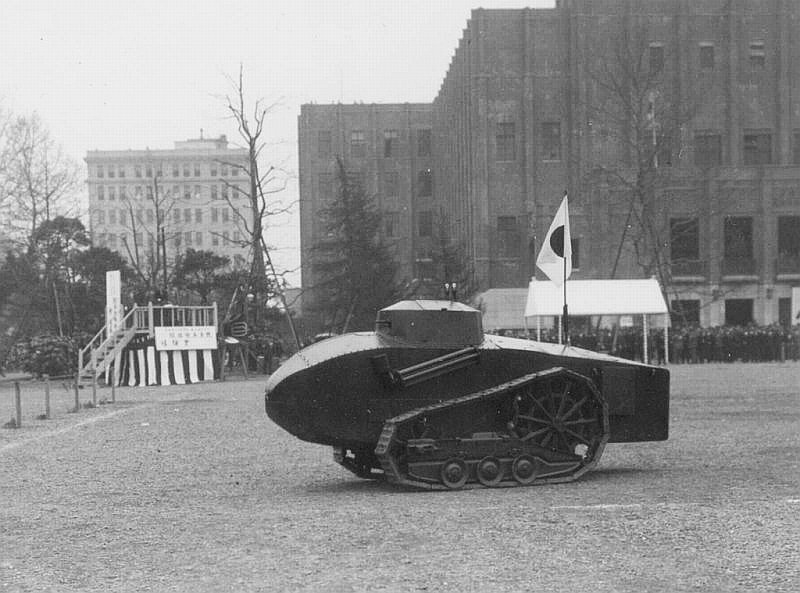 In 1929 engineer corps Major Nagayama suggested to use unmanned, radio-controlled vehicles for dangerous tasks like mine clearing and charge laying. Until early 1930 a Fordson Model F tracked prime mover was reworked as lightly armoured vehicle. The tractor was covered with face-hardened armour plates able to defeat infantry AP ammunition. The 20 hp gasoline engine was placed in the center. The steering mechanism was placed in the forward part. On the rear a payload container e. g. for ammunition or an explosive charge could be mounted. The radio equipment was mounted in a superstructure in the center of the vehicle. The control orders were transmitted by a modified infantry radio powered by lead accumulators. Two antennas on the superstructure received and transmitted data. Further details are unknown. 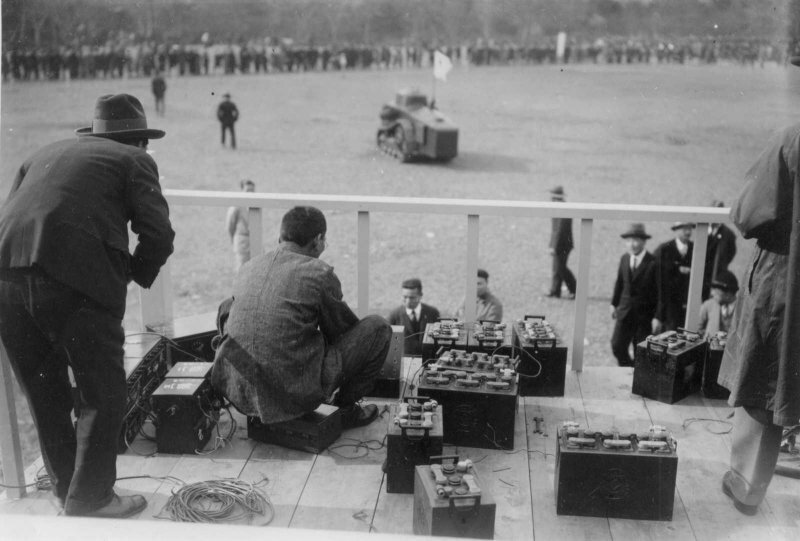 In late February 1930 a public demonstration was made at Tokyo Army Arsenal. The tank was a sensation in european and US newspapers. The development was discontinued most likely due to the limited mobility of the suspension but the basic idea was rated useful. The fate of the prototype is unknown. After the tests and trials with the Nagayama Tank were finished in the early 1930th the decision was made to continue development using a Type 94 Special Tractor in 1935. The conversion of the prototype was done fast and first tests were successful. So the decision was made to convert at least a second vehicle for operational tests. Further data are unknown. In 1936 the vehicles were reconverted to the standard configuration. The concept of a radio-controlled vehicle was also abandoned in favour of remote-controlled vehicles using electrical commands transmitted by cables. In 1932 Scientific Research Section No. 1 of Army Technical Bureau proposed the development of a remote-controlled tracked vehicle to fight enemy pillboxes and fortifications by laying explosive charges. Control orders should be send to the vehicle through a multipolar cable. The charge should be jettisoned close to the target. Then a 30 second delay was started firing the charge. During the delay time the vehicle and the command tank should leave the blast radius. The Type 89 Medium Tank should be used as basis for the carrier and the command tank. The first design did not reach the prototype stage due to mechanical and electrical problems. In 1933 the concept was still rated good and a second development program was started on a wider base. But instead of a large tank a small electrically powered tracked vehicle should be developed. Works started in late 1933. The vehicle frame was made out of a light-weight but very stable Aluminium-Silicon alloy. Suspension consisted of two pairs of small roadwheels, a fifth raised forward roadwheel to increase cross-country maneuverability, a forward idle wheel, a rear driving sprocket and two return rollers. Tracks with 87 links were usedTwo watertight 600 V electrical engines delivering 1 hp each were placed in the rear half inside the frame. Each engine powered one of the tracks. The control/power cable reached the vehicle from the rear. A barrel with a cone on its end was mounted on the vehicle as strain relief. On the bow was a metal box for the explosive charge. The cable had 13 wires, two for power supply and 11 for control commands. It was covered by a layer of rubber and hamp fabric. For an easier transport cable segments of 250 m length were used which could be connected. Maximum allowed length of a connected cable was 500 m on even ground. Cross-country only one cable segment should be used. The total height was just 460 mm, length 1425 mm. With a 35 kg charge the total weight was below 200 kg. On roads up to 18 km/h were reached, 4 km/h cross-country. During first tests in 1935 the vehicle worked very well. Nevertheless several changes were done. The cable was additionally surrounded by a dense wire mesh for additional stability and protection against splinters. This allowed to use cables with up to four segments increasing the maximum range to 1000 m. Cross-country the range should not exceed 750 m. The charge was rated too weak against pillboxes. So a charge of 40 kg using stronger explosives was developed. The metal box on the bow was removed and the charge was mounted directly on the bow. In addition a Bangalore-type charge with a length of 1075 mm and a 2,7 kg charge was developed to be used against wire entanglements and obstacles. Additional mounts for smoke canisters were added on the vehicle. This vehicle was introduced in 1937 under the designation "Type 97 Miniature Engineer Vehicle" and received the short designation "I-Go"
The 40 kg charge was still too weak against thicker bunker walls. So the decision was made to develop a larger version, too. It used the similar basic scheme but the roadwheels were bigger. In addition two 2 hp engines were used to cope with the total weight of 400 kg. A charge of up to 300 kg could be carried. An improved Bangalore-type charge with a length of 1151 mm and a 3,2 kg charge was introduced, too. In addition low-power shaped-charge warheads for these charges with a penetration of 30 mm steel and 110 mm concrete were also developed. This vehicle was introduced in 1938. The official designation of both vehicles was changed to "Type 98 Mini Engineer Vehicle", short designation became "Ya-I-Go". The small vehicle received the additional designation "Version Kou(A)", the bigger one "Version Otsu". rear view, the upright stick on the rear is the body of a Bangalore charge. The first unit using this vehicles was raised in early 1939 and stationed in Manchuria. A squad consisted of 12 men which operated a vehicle, a second was held in reserve. Besides the charge layers equipment consisted of a generator vehicle based on the Type 94 6-wheel Truck and several standard Type 94 Trucks for vehicle and equipment transport. For version Otsu a special armour shield made of 5 mm face-hardened steel was introduced to allow carrying a human observer under protection. An auxiliary generator vehicle based on version Otsu for heavy terrain was developed, too. This was replaced in 1943 by a generator vehicle based on the Type 98 Transport Tank So-Da. A standard attack was done by three squads. The first blows wire entanglements with the version Ko, the second destroyed obstacles with the version Ko and the third finally destroyed the bunker with a version Otsu. Standard starting position was between 200 m and 500 m away from the target. During exercises ranges up to 1500 m in easy terrain were reached. Larger ranges caused a current drop due to the cable resistance stopping the engines. In 1940 the units stationed in Manchuria were combined to 27th Independent Engineer Regiment. The nominal strength was around 2000 men operating 108 chargelayers of both versions. The rest of the 300 production vehicles was stored in Japan for homeland defense. In April 1945 27th Independent Engineer Regiment was relocated to Honshu for the expected homeland decisive battle. At surrender the unit sunk their vehicles in rivers and lakes. The others were destroyed, too. There is no known survivor. There were also versions tested for attacks on targets in the water and with larger charges towed behind the vehicle. None was introduced. There were also manned chargelayers like the engineer tank SS and an experimental vehicle based on the Type 97 Medium Tank. They were a relatively simple and effective device for a limited purpose - the Germans and British designs were also for use against minefields - setting off mines through sympathetic detonation - was that ever envisaged for the japanese equipment or just fixed defences (although keeping them on the home islands would seem they were at least to be used on the beaches or defiles against mobile attackers. Wow, incredibly interesting, thank you so much for citing those sources. Never knew the pictures I posted were of two different types, I also thought the bangalore torpedo was a radio antenna. I knew about the Nagayama remote device, shame they never fully developed it, in favor for budget friendlier projects, as well as restricting it to engineering purposes as opposed to the "track mine" of the Goliath. It seems to be the theme with overall Japanese designs. Has no one ever recovered those dumped into rivers? I would expect that at least the frame would endure. The Nagayama tank should be used against minefields by installing a pair of forks instead of the charge. The same configuration was later used on the Armoured Engineer Vehicle SS. The Ya-I-Go should indeed be used against allied tanks and armoured vehicles during Homeland Defence similar to the german Goliath. The frames were built as light as possible so I doubt they were able to withstand 70 years in the water. There were were some plans to to raise rare japanese war debris like the Type 4 Tanks Chi-To but afaik none was ever started due to the lack of money and official support. Last edited by tom! ; 12-05-2015 at 01:40 AM.